Things are different around the San Francisco Giants, and not simply because the three-time World Series champions are on pace to lose 100 games for the first time since 1985. The clubhouse, once populated by outspoken veterans and compelling eccentrics, is quiet to the point of being boring, some with the team say. 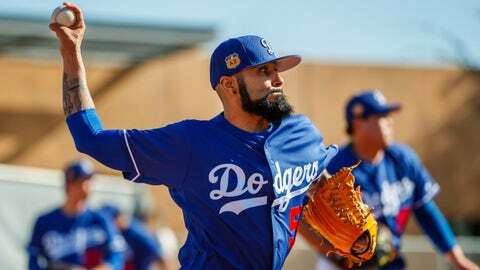 And the bullpen, once an unusually close unit that did nearly everything as a group, is adjusting to the distinctive routine of a big-money, free-agent closer for the first time. Mark Melancon, signed to a four-year, $62 million free-agent contract last offseason, was regarded as an excellent teammate in previous stops with the Pirates and Nationals, and also is well-liked with the Giants. But Melancon, sources say, rubbed some teammates the wrong way early in the season by putting an end to the bullpen’s 3:30 p.m. stretching session before night games, a practice that the relievers began in 2012. And for a time, Melancon and a handful of other Giants veterans often were late for the team’s main stretching sessions, prompting manager Bruce Bochy to call a team meeting about a month ago to address that matter and other concerns that he declined to specify. It is doubtful that Melancon’s routine — which includes him spending the first six or seven innings in the clubhouse preparing to pitch — would rankle anyone to the same extent if both he and the team were performing better. The Giants — who at 27-51 own the second-worst record in the majors — are losing for a multitude of tangible reasons. Melancon’s struggles are fairly far down the list, in part because the Giants rarely lead in the late innings. The team ranks next-to-last in the National League in runs per game and 12th in ERA, and its outfield defense rates as below-average. Melancon, 32, is 11-for-15 in save chances with a 4.58 ERA, and he missed 12 games with right elbow tendinitis in May. Last season, he went 47-for-51 in save chances for the Pirates and Nationals with a 1.64 ERA. 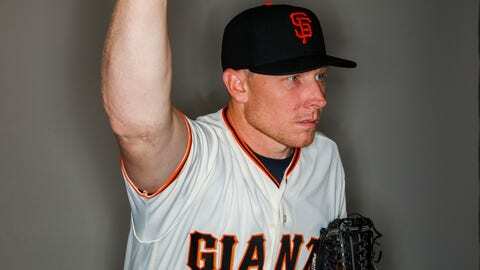 Melancon said that he is enjoying his time with the Giants and not sensing any friction with his teammates. Both Bochy and general manager Bobby Evans defended the reliever, with Bochy noting that Trevor Hoffman — one of the game’s all-time best closers — also followed his own routine during their time together with the Padres. 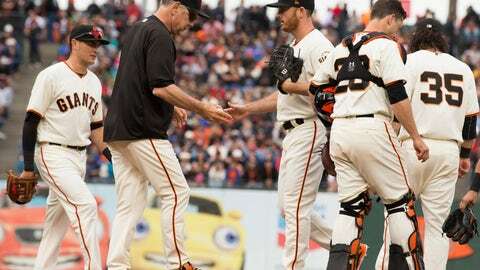 Evans, who was reluctant to speculate on the bullpen dynamics because he is not as close to the situation as those in the clubhouse, said that Melancon talked about building a strong bullpen culture during and after his free-agent negotiations with the Giants. Whatever difficulties exist might simply be part of a natural transition as the Giants evolve to a younger bullpen with Melancon as its leader. The Giants allowed two of their veteran relievers, Santiago Casilla and Sergio Romo, to depart as free agents, and lost another, Javier Lopez, to retirement. All three were members of the 2010, ’12 and ’14 World Series championship clubs. Romo was the closer during the 2012 postseason, while Casilla was the closer for much of the playoff run in ’14. Brian Wilson, another reliever with deep Giants roots, held the role in 2010. Melancon, on the other hand, came from the outside, and his deal was the richest given to a closer before Kenley Jansen and Aroldis Chapman signed their free-agent contracts days later. Change, then, was inevitable — and the new landscape in the bullpen is one part of the transformation in the Giants’ overall vibe. The current team is much less animated than the championship clubs were, many with the Giants say. Some of that, undoubtedly, is a product of losing. But the Giants seem likely to ponder a change in their mix in the months ahead. 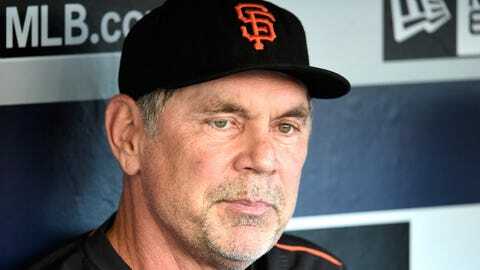 “We’re a very quiet group,” Bochy said. Pat Burrell, Cody Ross and Aubrey Huff were among the veterans who brought an edge to the 2010 team. 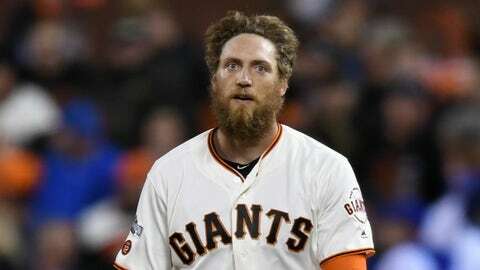 Hunter Pence’s famous dugout speech helped rally the Giants from a two-games-to-none deficit against the Reds in the 2012 Division Series. Pence, Michael Morse and Pablo Sandoval were among the forceful personalities in ’14. Sandoval, who was an often noisy and boisterous presence during his time with the club, departed as a free agent after that season. Pence has suffered a number of injuries in recent years and declined offensively, making it difficult for him to be as vocal as he was in the past. Some with the Giants muse that the team even misses Angel Pagan, who created an odd sort of unity because most of the players disliked him. The effect of chemistry is impossible to measure. Almost to a man, the Giants’ current players — starting with All-Star catcher Buster Posey — are high-character types who play the game hard and correctly. Still, Evans acknowledged that the team’s more subdued nature is a topic of internal conversation. “Those are fair questions,” Evans said. “I don’t think I can be definitive in my answers, but it’s not lost on us that we’re maybe a little quieter clubhouse than we’ve been in the past. I can’t answer that as being a factor or not. “One of the things that has helped us be successful is that we’ve had a very professional group of players who show up and get their jobs done. They don’t ride the emotional waves of success or of difficulty. That’s a strong attribute of a good player. It’s a hard environment. It’s a different environment. On and off the field, the Giants have changed.